In Dutch oven, heat Farro ingredients to boiling. Reduce heat; cover and simmer 25 to 30 minutes or until farro is tender; drain and place in large heatproof bowl. Stir occasionally, and allow to cool to almost room temperature, about 35 minutes. Meanwhile, in small bowl, mix Dressing ingredients; refrigerate while making salad. Toss Salad ingredients in bowl of farro. Toss with Dressing. Substitution : If you have trouble finding mozzarella pearls or bocconcini, you can purchase a larger ball of mozzarella and cut into small pieces. 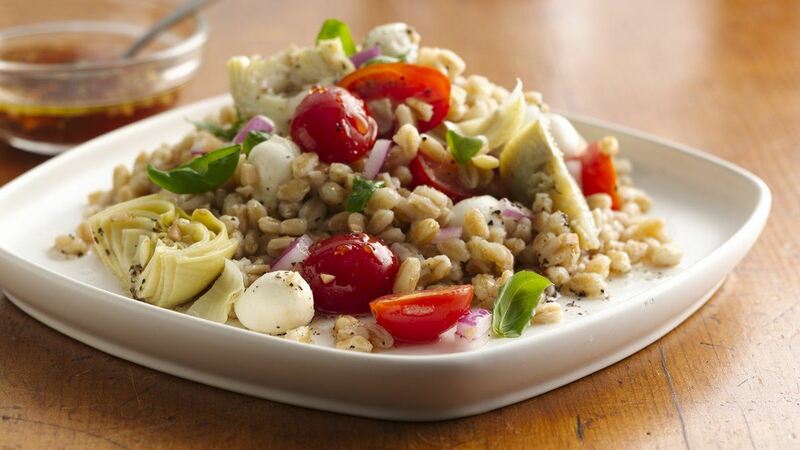 Tip : Can’t find farro? Pearled barley or wheat berries can be substituted. Cook the grains as directed on package.